Kriseman is trying to make President Trump a major local campaign issue. 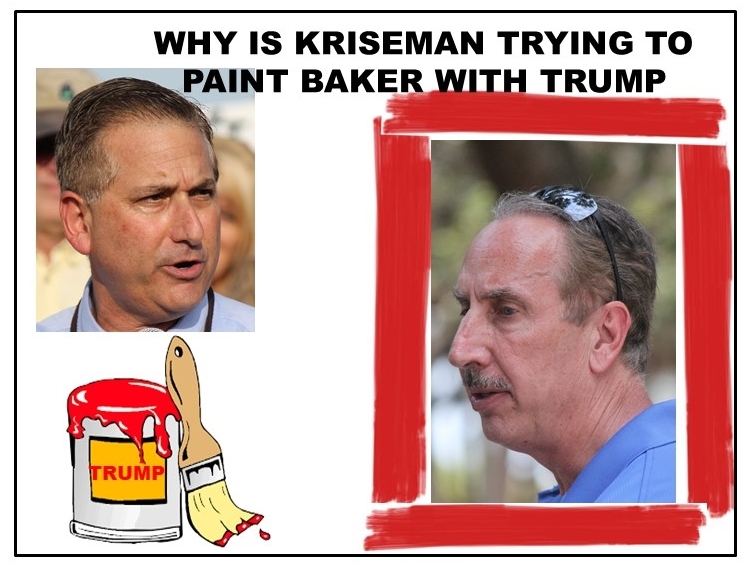 Kriseman hints that Baker is another Trump, questions who Baker voted for and tries desperately to tie everything that Trump does back to Rick Baker. Let’s begin with some clear facts. Rick Baker is not a Donald Trump surrogate. Baker has never run for a partisan office and has always governed as a pragmatic problem solver not a parochial partisan. Further, Rick Baker has been consistent in his approach to governing. During his nine years as Mayor of St. Petersburg, his focus was on St. Petersburg and the needs of its citizens. No partisan politics, no mayor’s office full of political cronies, consistent respect for the needs and desires of the public, fiscal responsibility, solid planning and passion for those in St. Pete that need help the most. I know because I worked for him. While there is no doubt that events in Washington affect what happens on the ground in St. Petersburg, all local mayors have a process to access resources in Washington, it is just a shame Rick Kriseman does not who they are or how to use them. Do you see any presidential influence in any of those decisions? Who set up St. Petersburg as a sanctuary City? – Rick Kriseman to gain political favor and attention. Who has consistently ignored your desires as expressed in referendums? – Rick Kriseman. As a voter in this mayoral election, you should be less concerned with political party and presidential politics and more concerned about your future. Your local government is the one that has the greatest impact on your day to day life. It provides you safe water, functional sewers, waste disposal, police and fire protection and establishes your quality of life. You should be able to trust the Mayor, who runs it. With Rick Kriseman as mayor, your life is a lot more likely to be influenced by the Democratic party than it is to be affected by Donald Trump’s influence on Rick Baker should he be elected Mayor. Rick Baker is his own person. Not Donald Trump’s, Jeb Bush’s, or Bill Edwards. No pandering, no political games, no vying for favor in Washington; just working truthfully and honestly for everyone in St. Pete every day. If you live in South St. Petersburg what has Rick Kriseman done for YOU in the last four years? Kriseman has no record in the African-American community in St. Petersburg. So Kriseman buys ads telling African-American voters to vote against Rick Baker because Baker is on Trump’s team. The truth is Baker has never met, talked to or worked with Donald Trump. Why is Kriseman selling a lie to the African-American voters in St. Pete? Because he cannot run on his partisan record. Before you decide to go vote for the Democrat running for Mayor of St. Pete remember this: he has lied to you from the very first day he took office.